These fragments, which date to the Middle Kingdom (ca. 2000-1700 BCE), were excavated from the North Cemetery of Abydos in 1901 by John Garstang. The museum supported Garstang’s work through the Egypt Exploration Fund. Despite the severe insect damage, the preservation of the painted details on these fragments is remarkable. This fragment features 3 usekh collars, which were often reserved for nobility. Beside each collar is a mankhet, or counterpoise. 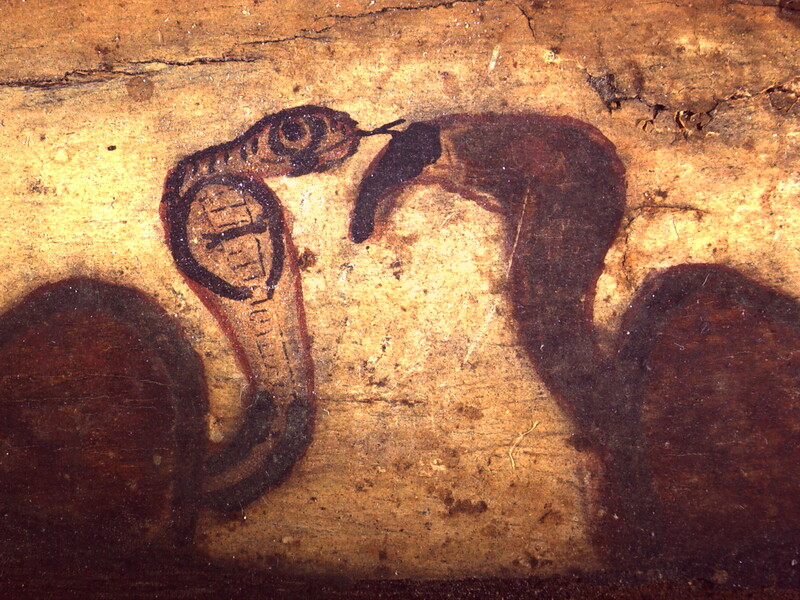 The hieroglyphs above are the names of each of the collars, which are slightly different. 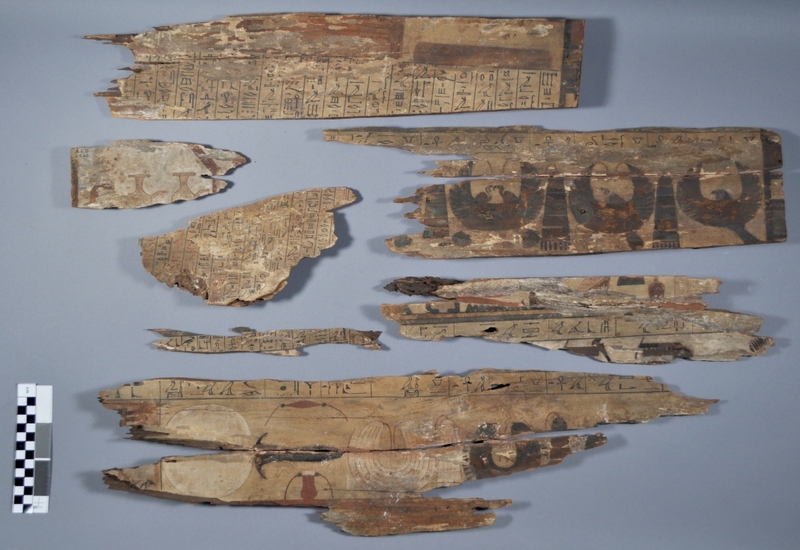 These coffin board fragments have never been exhibited, and our renewed interest in them is due to the fact that we are currently excavating tombs from the same time period in South Abydos, including the funerary complex of Senwosret III. You can read a lot more about this project in the recent Expedition issue and on the museum blog by following this link. 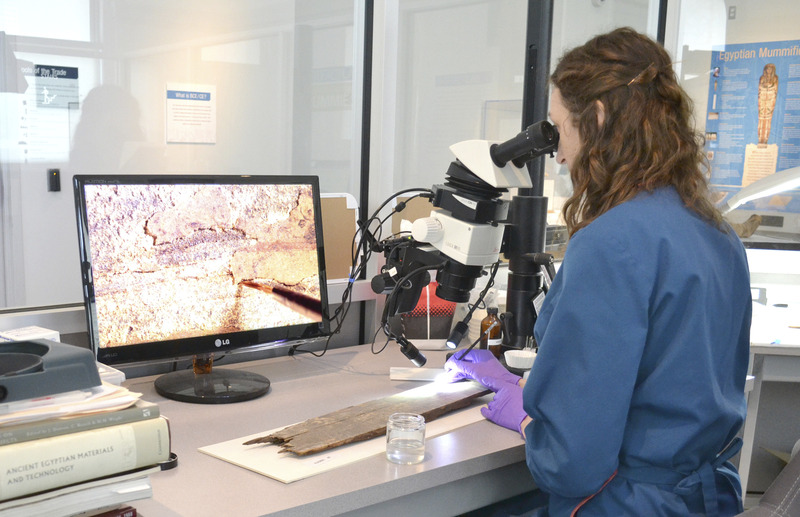 In order to exhibit the coffin fragments, they need some extensive conservation treatment. Their surfaces are dirty, the paint is cracked, cupped and lifting from the wood support, and is very fragile, and some of the boards are structurally unstable due to the extensive insect damage. We are currently working on these boards in the lab, and we have made some good progress. We are cleaning the painted surfaces with a kneaded rubber eraser. The eraser can be shaped to a fine point, and working under the binocular microscope, it is possible to remove the dirt from most of the painted surface without disturbing the fragile paint. Some areas of paint need to be stabilized before they can be cleaned. After testing a variety of adhesive solutions, I settled on my old friend methyl cellulose, a 2% solution of methyl cellulose in water to be exact, to consolidate fragile areas. I am now working on testing some fill materials, both to stabilize the edges of lifting paint and also to stabilize the fragile wood. I will post an update as soon as I make some decisions and proceed with this part of the treatment!